Good Morning Darers, Lynne here - are you ready for a new dare? Thanks for all the amazing work for Gill’s Op shop dare last Friday, and Tuesday’s Cars, Boats, Trains & Planes Little Extra - we love seeing all the different takes on the dares that are set. Of course we still have our fab Guest Designer Rachel with us this week. So, on with the dare. This week I’d like you to use a FRAME or FRAMES on your card. You can use any type of frame you so wish. How about a die cut frame or a hand cut frame. You can frame your card with brackets or flowers or how about some doodling - the choice is yours. 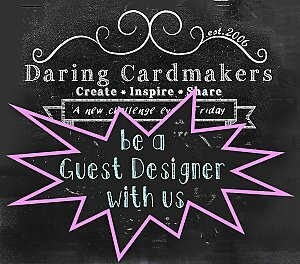 Remember to leave a comment on the Daring Card Makers Blog so we can hot-tail it over to see your creations. We do visit every Blog and try to leave as many comments as possible. There are so many amazing creations that we can't all leave a comment - we hope you understand. You can still join in the fun if you don't have a Blog, just send a Photo/scan to the team at; daringcardmakers@hotmail.co.uk and your creation will be added to our Gallery for all to see. is the theme for our Little Extra challenge this week. A good chance to stock up on kids cards and make a few of those poor, unloved "cards for men", maybe? How about "congratulations on Passing your Driving test" or "Got your Wings" for newly qualified pilots? - ok so we may be reaching a bit far with that one, but you never know! Basically, what we'd like you to do is put some transport on your cards this week, how you do it is up to you! - go on, have a bash, we dare you! We have fab news to share with all our DCM friends - our lovely Kel gave birth to a beautiful baby boy on Friday 21st - huge congratulations Kel and family - and welcome to the world baby Harrison. who's coming to play with us! .........and make a GORGEOUS card from what you find. Please keep those One Word cards coming - they are fantastic and so inspiring for us all - remember this dare stays open till Friday so loads of time left yet. However, just in case you're ready for another little nudge in the crafting direction we have our usual midweek Little Extra. We'd love to see your Golden Creations, so please come back when you've made your card and tell us where we can see it. Hi Darers. It's Rhi here, happily married and ready to get on with some crafting! We've loved seeing your Big and Little cards, and doesn't it feel good to have started those Christmas Cards! This week I dare you to use a Word as the main focal point to your card. It can be a name, a greeting or just a word that inspires you. You can use other text but only one word as a main embellishment. So dig out your dictionaries, die cutters, alphabet stamps, rubons or download a funky font and show us what you can do! The design team have come up with some fabulous creations to inpsire you. Big & Little We'd like you to use items in pairs of Big and Little - so you need to have both sizes on your card ie big & little buttons, big & little die cuts, big & little hearts, big & little circles etc The theme of your card can be whatever you like this time, so that's nice of us, isn't it? As usual, here are a few cards to get you thinking, don't forget to come back and leave us a message and we'll pop over to your blog to see your creations. Thank you to everyone who joined in with this weeks dares, we hope you enjoyed making the cards as much as we enjoyed seeing them all. We're sure you'll want to join with us as we wish Tracie and Wayne a wonderful day and every joy and happiness for their lives together. Well, the time has come for our first Christmas card dare of 2007. But as loads of you have already shown some fab Christmas cards on your blogs, we thought we'd make things a little more Daring, interesting, tricky or downright mean - depending on your point of view! It has to have at least one hole somewhere in the design! ......BUT by "hole" we don't just mean the sort of hole you poke a brad through, or the holes you make for/with stitching - or even the hole you make to put an eyelet in - although you can use all those techniques too if you want. We want you to be a bit/lot more inventive and creative than that, and we think you'll be able to come up with some wonderful ideas for making cards to fit this recipe. We'll leave it to you to guess which team member said "if I put Baby Jesus on my card, will that be "Holey" enough?" We're very happy to welcome Paula aka Mini-book Pixie as our Guest Designer for the next couple of weeks. Paula has joined in pretty much every dare since the DCM started, and it's especially fab that she's agreed to come and be our GD as we're now in the run up to our first anniversary. We're looking forward to seeing your Torn, Holey, Purple Christmas creations so please come back and let us know when you've made your card and where we can see it. all that soft, strokable stuff counts for this one and that's it, easy-peasy, lemon-squeezy! This is our 101st post! Most people would have made a big thing of the 100th but we like to think that we are a little bit different. (It is not that we failed to notice it, oh dear me no!) So this is a great opportunity to once more thank you for making this such fun! You are all so talented and stretch our dare challenges in all sorts of inspirational ways. Which, as I discovered to my embarrassment, when I laid it on the team, is only really possible to understand if you live in the UK. And even better, are Welsh. So... a trio of Welsh Barbers means that on your card you need to have 3 die cuts! The team roused themselves from their bafflement and came up with these brilliant cards - can't wait to see yours! If you don't have access to die cuts in any shape or from, you can still play along. You can then use punches. And if you don't have punches then you can do hand cutting. See how nice I am? BUT no cheating now! No reaching for the scissors if you have a machine to hand - or even some old die cuts you bought ages ago (that would be me then!) You CAN use punches and scissors etc as well as die cuts though. See, very nice!! Leave us a comment and your Blog link and we’ll come over to check out your creations. You can still join in the fun if you don’t have a Blog. Just send a pic/scan of your creation to the team at daringcardmakers@hotmail.co.uk and we’ll add it to our gallery for all to see.